percent higher than the July 1961 tottl of $1,617.0 million. 1961 total of $1,538.4 million. of unmanufactured cotton from $59.0 to $66.2 million. For sale by the Bureau of the Census, Washington 25, D.C. Price 104 per copy. (Quantity in units indicated; value in millions of dollars. 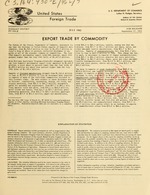 Figures for 1962 are as originally issued and have not been revised to include published conections. Animal ind fish oils and greases, inedible....... 1,000 lb..
Crude petroleum ........ .....................1,000 bbl..
All other crude materials ...........................value.. Vegetables, fresh or dried......................1,000 lb.. Fruits, fresh or frosen........................1,000 lb..
Meat and meat products.......................... 1,000 lb.. Fish, canned, prepared, etc....................1,000 lb.. Supplement to Report No. FT 930-E showing the Schedule B numbers included in the individual economic class and commodity totals as available on request.